Alternative suits : Press down and A+B+C+D simultaneously on the character selection screen. Constant max. Zoom out: Simultaneously press RIGHT+START+C on the character select. 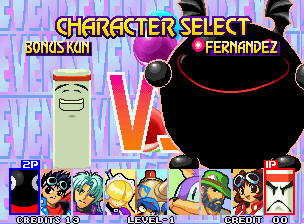 Play Bonus Kun & Fernandez: Press START on the second controller during a 1P game. Change the winning pose: Press LEFT+START during the character select.